"I dedicated myself to my collection. I made it my life's work. I am not an art collector. I am a museum." 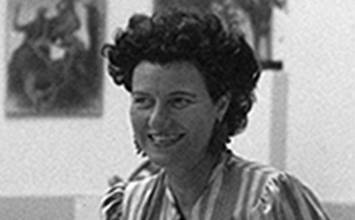 Born into relative wealth and into a well-known and powerful family, Peggy Guggenheim harbored an independent streak that led her to create one of the most important collections of modern European and American art. Relying on advisors, including the Dadaist Marcel Duchamp and the anarchist poet and critic Herbert Read, Guggenheim quickly amassed paintings by the most avant-garde European artists before the outbreak of World War II. Her collecting habits continued in the U.S. when she gave the burgeoning Abstract Expressionists the opportunity to exhibit in her Art of This Century Gallery alongside their European precursors. Her love of art and creativity bolstered her own eccentric lifestyle in New York and later in Venice, where her collection is permanently housed. Her dedicated patronage of particular artists, including Jackson Pollock, stood in sharp contrast to later collectors who were looking mostly for investment opportunities. Guggenheim was one of a handful of women, including Betty Parsons and Katherine Dreier, who helped turn the art world's attention to modern art and, more specifically, Abstract Expressionism. While armed with the help of knowledgeable advisors, Guggenheim's collecting was based on her felt reaction to the work. She bought what she loved, what drew her in, what was provocative. A bohemian at heart, Guggenheim saw her collection as a creative endeavor and one she wanted to share with the larger public. A fast learner, Guggenheim was forward thinking with the exhibitions staged at her various galleries. Giving Wassily Kandinsky his first one person show in London, she broadened the appeal of Modern art in Britain, and she was daring enough to give the young Abstract Expressionists some of their first high-level exposure in New York and subsequently in Italy. Her New York gallery, The Art of This Century, was one of a kind with its innovative exhibition practices and gallery spaces. It became a sort of laboratory not only for new, avant-garde art but also for how the viewer physically interacted with works of art and created relationships with them. In many ways, Guggenheim, like Museum of Modern Art director Alfred Barr, was pivotal in getting so-called "degenerate" art safely out of Europe on the eve of World War II as well as encouraging European artists to wait the war out in the United States. 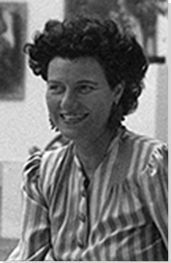 Marguerite "Peggy" Guggenheim was born on August 26, 1898 in New York into great wealth due to the family's fortune in the mining and smelting industries. Her father, Benjamin Guggenheim and his brother Solomon R. Guggenheim were power brokers. They had five other brothers. Florette Seligman, her mother, came from a family known for both its eccentricities and its social status, as her father was Joseph Seligman, a banker who became the leading national financier in the Civil War era. This enigmatic painting depicts a view of a sunlit crenellated tower, its fortress-like circular shape dominating the horizon. In the lower third of the canvas, a shadowed square between two looming semi-classical walls frames the tower, the strong lines of perspective creating the sense that the viewer is walking through a dark corridor toward its ominous shape. At center right, an equestrian statue on a white rectangular plinth is depicted in black shadow, casting a long shadow across the plane of sunlit ground. The work is reminiscent of an Italian landscape, yet it also evokes a dreamlike feeling. The objects become hallucinatory, as the statue's shadow at first glance can seem like a nightmarish creature looming in wait for the viewer to emerge from the square. The scene is remarkably empty of figures and of movement, while the discordant perspective and irrational light source create a sense of anxiety. Exemplifying the artist's metaphysical style, in this work, as the artist wrote, "every object has two appearances: one, the current one, which we nearly always see and which is seen by people in general; the other, a spectral or metaphysical appearance beheld only by some individuals in moments of clairvoyance and metaphysical abstraction." When Guggenheim began collecting art, she trusted her advisors Marcel Duchamp, Howard Putzel, and Herbert Read to teach and guide her on her new quest. Her biographer Anton Gill explains, "Peggy had to be shown the difference between what was Abstract and what was Surrealist and between the 'dream' Surrealism of, for example, Dalí or de Chirico and the 'abstract' Surrealism of, say, André Masson. She was an eager and quick learner, showing a natural affinity and sympathy for what she saw." Guggenheim's early adoption of Surrealism and her exhibition of both abstract and dream Surrealism played an important role in New York City for young artists clamoring to see European art. In this painting, regular and irregular geometric shapes, as well as more organic forms, depicted in primary colors, are juxtaposed against an off-white trapezoidal plane, which itself sits in a field of inky black. The shapes seem to both float above the plane and to be grounded within it, creating a dynamic spatial relationship. Some of the abstract shapes evoke symbols, like the number 3, whereas others evoke naturalistic associations - a boat, a lance, a piano keyboard, a checkerboard - but are abstracted to non-referentiality and deployed like colored elemental forms to create visual rhythm. The title refers to the white cross within the checkerboard in the upper right, and the shape is echoed throughout the canvas - in two black crosses in the lower center and the cross handle of the lancet shape intersecting a circle at center left - creating a kind of musical point and counterpoint, as the evocative symbol is treated as an abstract shape. The artist called this work reflective of his "cool period" in the early 1920s; here he began to emphasize geometric forms, reflecting both the influence of Malevich's Suprematicism and the Bauhaus where he began teaching in 1922. In 1938, the Guggenheim Jeune held the first solo exhibition of Kandinsky's work in London, largely organized by Kandinsky himself, and White Cross featured prominently in Guggenheim's collection in the following decades. Marcel Duchamp had sent Guggenheim to meet Kandinsky, and she found the artist "so jolly and charming." According to Guggenheim, when she visited, Kandinsky talked to her about how he felt another artist, Rudolph Bauer, had supplanted him in the eyes of her uncle Solomon, and he begged her to try to convince her uncle to stop patronizing Bauer and start buying his paintings again. When Guggenheim brought the matter to the attention of her uncle's art advisor, Hilla Rebay, Rebay, who was Bauer's lover, rebuked Guggenheim and said they would never buy a painting from her gallery. This sculpture is a sleek aerodynamic form, evoking a bird in flight, yet devoid of representative details. An embodied arc of light soaring upward, from a slender base conveys unfettered movement. The highly polished surface is luminous, as the artist felt that such attention to the material and its surfaces made the works seem to proceed "out from the mass into some perfect and complete existence." Brancusi insisted that the elemental form was not abstract but revealed "the being that is within matter." Brancusi showed in the 1913 Armory Show, where he became close friends with Marcel Duchamp, who became a lifelong advocate for his work. John Quinn became an early leading patron of the artists, and the artist later said, "Without the Americans, I could never have produced all that, nor even perhaps have existed." When Guggenheim visited Brancusi in Paris, she hoped to purchase this work, already famous for the 1927-28 legal debate when the U.S. Customs office refused to classify it as an artwork. She later acknowledged that she had a brief affair with the sculptor, whom she described as "half-God, half-peasant," because she thought he would then sell her the work for less. On the day that the Germans invaded Paris, she visited his studio, where he carried it out in his arms and gave it to her with tears in his eyes, though she said later that she did not know whether they were in response to parting with her or parting with his artwork. This painting dynamically surges with swirling lines and biomorphic forms that, curving vertically through the pictorial plane, also create horizontal movement that seems to extend beyond the edges of the canvas. The forms, as art critics have noted, suggest "several human figures walking, or possibly birds, or letters and numbers," though the artist was to describe it as "a stampede...[of] every animal in the American West, cows and horses and antelopes and buffaloes. Everything is charging across that goddamn surface." At eight by almost twenty feet, the painting is a pivotal piece in Pollock's career. Art historian Ellen Landau explains that even though it retains Pollock's "mythic imagery," it signals a new scale, and "the areas of loose paintwork give you glimpses of what the future's going to be." The work also pioneered his innovative use of commercial household paints and of applying paint by splashing it onto the canvas. Guggenheim commissioned this mural for her new apartment on 61st Street. Piet Mondrian encouraged Guggenheim's patronage of Pollock when he told her at the 1943 Spring Salon at Art of This Century upon seeing his work, "I have the feeling I'm looking at some of the most exciting art that I've seen so far in America." Subsequently she signed a contract with Pollock and paid him a monthly stipend that allowed him to quit his job as a carpenter at the Museum of Non-Objective Painting, as the Solomon R. Guggenheim Museum was then known. She originally planned for the mural to be painted on the wall of her entrance hall, but Duchamp recommended canvas, since it could be moved. The work was supposed to be finished for her exhibition of his work in November 1943, but the artist felt, as he said, "completely blocked." As months went by, Guggenheim said that he needed to finish it by her birthday in February or she would cut off his stipend. While rumors suggest that Pollock completed the work in one night, just in time to deliver it for her birthday, conservation examination has shown that he had already been working on the painting. The work appeared to great acclaim. Critic Clement Greenberg saw it as the arrival of "a great artist," and the story of its making became part of the legend that surrounded Pollock. Before leaving for Venice, Guggenheim donated the work to the University of Iowa Museum, marking just one of the many times she donated a number of Pollock's celebrated works to various institutions. This Neoplastic work employs black horizontal and vertical lines creating an asymmetrical grid against a gray background. The style, developed by Mondrian, characteristically used a palette reduced to the primary colors along with black and white, but here the approach is even more reductive, with a single note of red deployed in a small rectangle at the bottom of the canvas. The black lines vary in thickness, which interjects an element of unpredictably into the orderly grid and creates a dynamic movement, as the eye moves vertically and horizontally to apprehend a pattern. The work conveys a feeling of severe austerity and, at the same time, becomes an abstract schema of uncertainty and the search for order. In 1938, fleeing the war, Mondrian moved to London, where he continued working in exploring what he called the "mutual interaction of constructive elements and their inherent relations," a key tenet of his Neoplastic style which used abstract form to create "a real equation of the universal and the individual." During this period, Guggenheim's support for his work played a vital role as it did for a number of European artists who were forced to flee into exile. His paintings were marked by the severe and rigorous approach shown here, the groundwork for the complex grids pulsing with color that followed after his immigration to the United States where he became part of the circle of émigré European artists associated with the Art of the Century Gallery and a knowledgeable voice Guggenheim trusted. The elongated female figure on a tilted base, whose arms hang closely by her sides, faces forward, seemingly frozen in space. The bronze surface's rough texture emphasizes materiality, both of the work's medium and of the human body. Capturing the effects of light, the surface also evokes a state of ruin, as if the figure had been torched or sandblasted. As a result, the ghostly figure seems on the verge of dematerializing, or, perhaps, materializing out of a state of near ruin. The work, as art historian Lucy Flint wrote, conveys "several notions simultaneously...one's consciousness of the nonmaterial presence of another person, the insubstantiality of the physical body housing that presence, and the paradoxical nature of perception." From 1942-46, the sculptor primarily made diminutive figures; he said in 1947, "Lifesize figures irritate me...because a person passing by on the street has no weight; in any case he's much lighter than the same person when he's dead or has fainted. He keeps his balance with his legs. You don't feel your weight." As a result, he "wanted ... to reproduce this lightness, and by making the body so thin." This work is a pioneering example of the artist's mature style, known for his elongated and thin anonymous figures that accentuated their verticality, while evoking the existentialism of the post-war era. Guggenheim was a champion of his work from her earliest days of collecting, and though the sculpture was created in 1947, the artist had the work cast in 1957 for her collection at Palazzo Venier dei Leoni.